Review written by ALCI member Sorcha Nic Lochlainn. 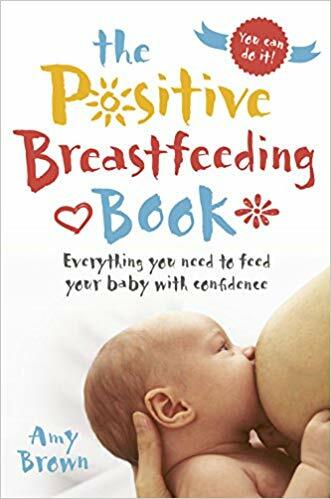 The Positive Breastfeeding Book is by the clearly passionate and knowledgeable Professor Amy Brown and is a genuinely helpful and informative resource for breastfeeding mothers and supporters everywhere. The positivity starts before you even open it, with bright, colourful writing, a little “you can do it” message and the tagline “Everything you need to feed your baby with confidence”. It pretty much does what it says on the tin, imparting knowledge, confidence and inspiring stories in women’s own voices on every page. Every chapter is thoughtfully laid out, with a myriad of information on common and not so common experiences. There is little judgement on these pages, but there is encouragement to think about all the reasons behind breastfeeding challenges and it definitely carries the message of “a breastfeeding solution for a breastfeeding problem” throughout. The author gives solid information on normal newborn behaviour, growing babies and chapters like “How can family and friends support you” give helpful tips on getting the people around you to support you in a meaningful way, and are a great way of getting away from the “giving a bottle is helping” mindset. The chapters on newborns, troubleshooting, complications and getting support offer a gentle, consistent and compassionate message, letting women take charge of their breastfeeding journeys without coming across as preaching or overly judgemental. Chapters on feeding premature babies and multiples, relactation and LGBTQ feeding and other more specialised issues are interesting enough for the general reader but contain great information and resources for people in these more complex situations. The book ends with chapters about introducing solids, introducing formula and ending breastfeeding. The formula chapter gives great information, and cuts through the nonsense to offer real advice. I like that it doesn’t shy away from this topic, rather introduces the reader to the political and social complexities of formula feeding and it’s marketing. On the downside, this book is very text-heavy, and I imagine in the fog of new-babyhood it might seem a little overwhelming. Some bullet boxes or similar might help those in the middle of those struggles. There are no pictures apart from head shots of some of the contributors, and this is where the book really falls down. It doesn’t need necessarily the traditional step-by-step pictures of other breastfeeding books, but some pictures of mothers and babies in all situations would enhance the books message that breastfeeding is for everyone. The cover picture is of a baby feeding, but there is no mother – and I personally really dislike this disembodied breast type of picture. These are pretty minor quibbles, in the overall context of this great book. One of its biggest strengths is in offering women further resources like helplines, web-based supports and IBCLC information, and the advice to go to breastfeeding groups is repeated in almost every chapter – reinforcing the concept that support is central to successful breastfeeding. I would not hesitate to recommend this book, it is a shining light of positivity, with almost every possible topic covered, or at least mentioned, all in a very breastfeeding focused way.